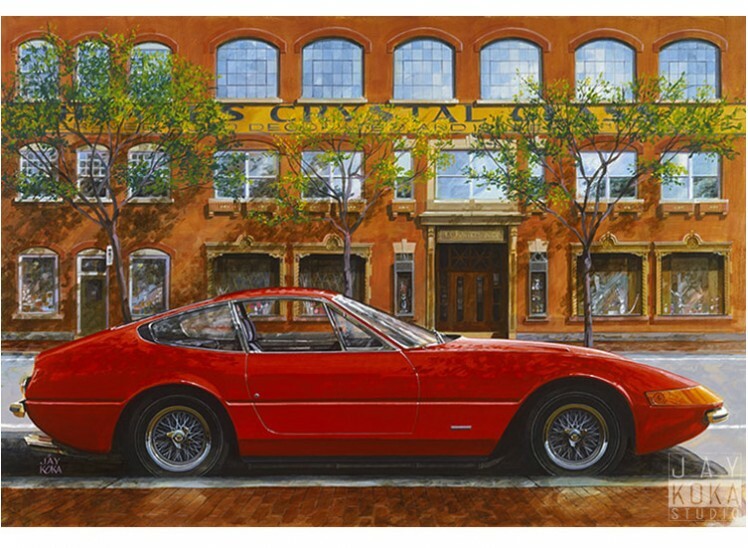 "HAWKES CRYSTAL GLASS" The 2018 Annual Meet of the Ferrari Club of America at Corning New York (and Watkins Glen) celebrates the Daytona. 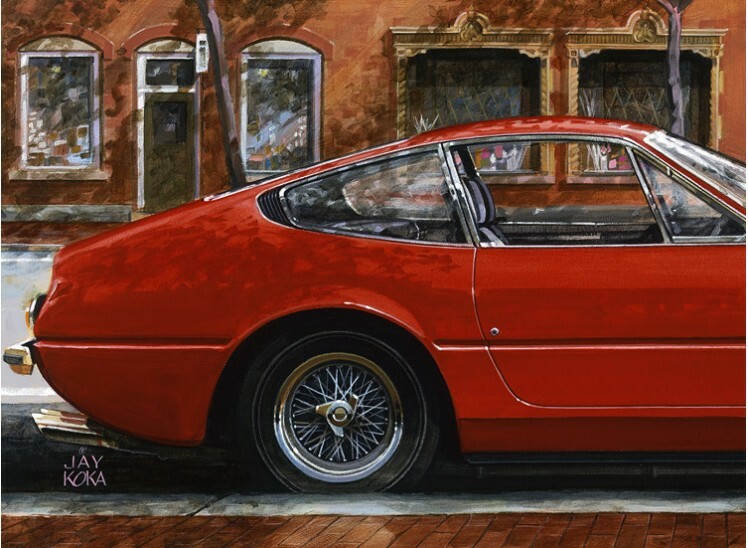 First introduced to the public at the 1968 Paris Salon del’Automobile, the 365 GTB/4 Daytona remains an iconic Ferrari. Many mark it as the end of the Enzo era and the last of the classic front-engine GT Ferraris. The Hawkes Glass Building was home to T.G. Hawkes & Co.’s eighty-two years in the cut glass business. 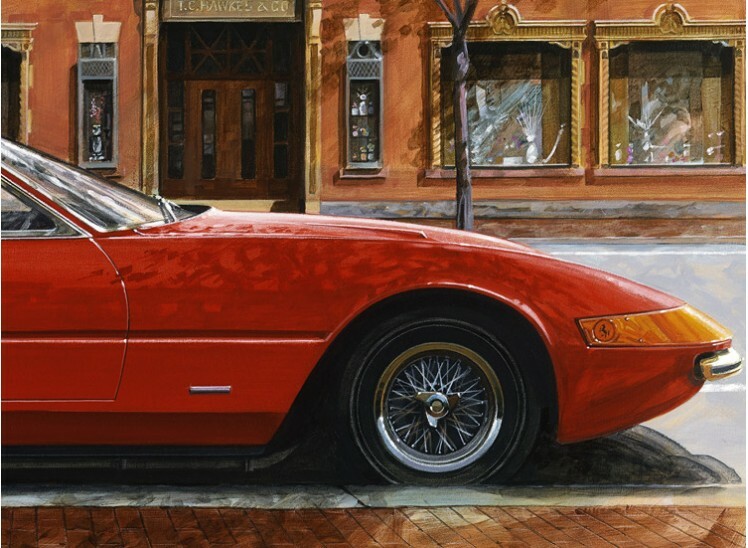 This is the original event art that has been published in an exclusive FCA edition of 600 signed/numbered/embossed prints on paper, approx 10 x 14.5 inches for distribution at the event. 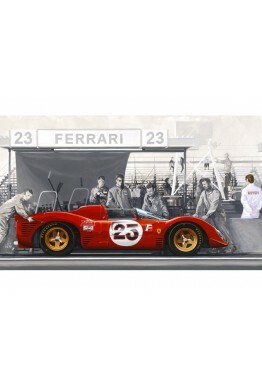 Now released in a full size canvas edition of 10 signed/numbered prints at 44x30". SHIPPING: Shipped rolled requiring stretching on arrival. Shipping for Canada and US INCLUDED. For Europe, US$45, please select SHIPPING item from "Shipping, Books&Media" Category. 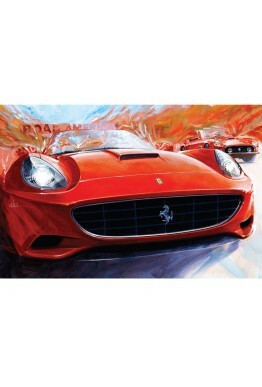 This is one of two paintings that were considered for the Ferrari Club of America 2013 Annual Meet P..
"READY FOR THE GRID" The 2017 Annual Meet of the Ferrari Club of America at Daytona marks the iconic..